Saving money is one of my favorite hobbies! I’m always looking for easy ways to earn a free Amazon gift card that I can use on Christmas gifts or for birthdays. Doing a little bit everyday using these apps and websites can help you earn extra money, too! Remember, to use these tips for saving money with Amazon to stretch your gift cards even farther! There are many ways you can earn points or “swagbucks,” everything from surfing the internet, taking surveys, to shopping online. You can turn in your “swagbucks” for Amazon gift cards (or a variety of other popular gift cards). 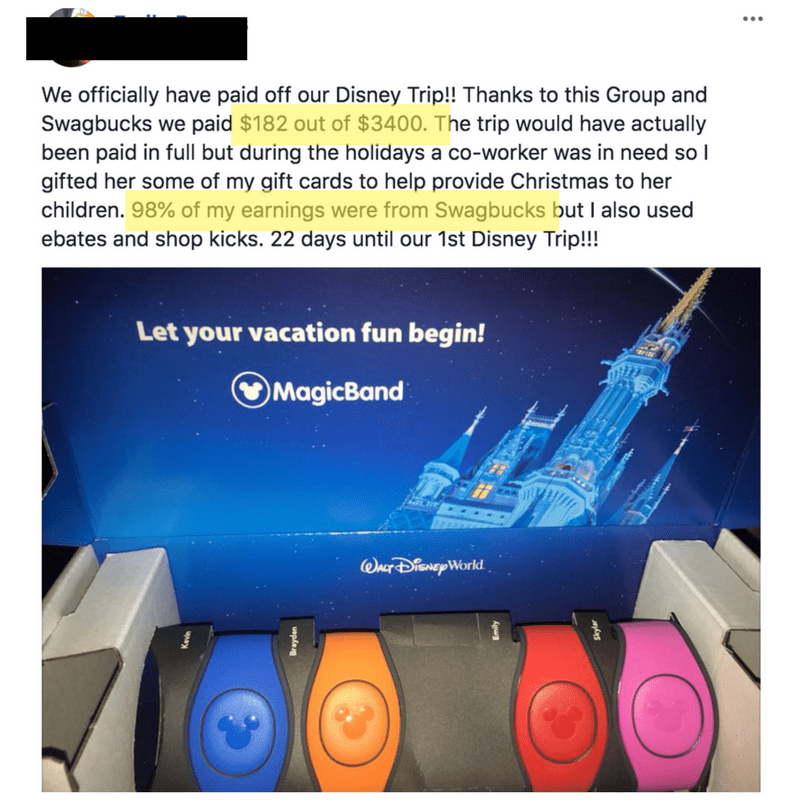 Check out this post below…this mom was able to cover MOST of her family’s Disney vacation just by using Swagbucks! What are you waiting for?! Sign up for Swagbucks here! Survey Junkie is a website that allows you to sign up for many different survey companies. You can earn points for taking surveys and cash out for a free Amazon gift card. JOANY is a healthcare concierge service that helps people find the best healthcare plans, doctors, and figure out complicated medical bills. JOANY is offering a sweet deal, you can earn $25 in an Amazon Gift card or in cash in exchange for a quick 10 minute survey. Meet these qualifications to start the survey and earn $25 bucks! You do not receive your health insurance through an employer. You currently have this health insurance active. You are not on Medicaid, Medicare or VA health insurance. You do not receive your health insurance through your school/university. You have not taken this research study using your current health insurer previously. The JOANY survey is only 10 minutes and fewer than 50 questions. Your answers are protected under the HIPPA. You get to voice your opinions about health insurance and get paid! Start your survey here. Nielsen Panel, the same company that does TV ratings, is a consumer research panel that is really easy to use. Complete a short survey and download the app to your mobile phone/tablet which Nielsen will use to report consumer behavior. You can earn up to $50 a year in Amazon gift cards (or other popular gift cards and rewards). Sign up for Nielsen Panel Mobile App here! This is one of my favorite ways to save money while I’m getting my grocery shopping done. Sign up for Ibotta and start saving money on groceries and other purchases at your favorite stores like Kroger, Target, Walmart, and more! You can earn points for taking surveys and daily polls which can be turned in for Amazon Gift Cards or cash with Paypal. Want More Ways to Earn Extra Cash Back? Try Ebates! My favorite way to earn cash back when shopping online. Read more tips and tricks for how I earn extra cash with Ebates! Drop Rewards is a program that you link your credit or debit card to and earn Drop points. You can exchange your Drop points for Amazon Gift Cards or other popular gift cards. It’s so easy to earn Drop points shopping and doing what you already do! Also, you can still earn loyalty points that you would be earning anyway like your Grocery Rewards Program, Starbucks stars, etc. Sign up for Drop Rewards here! Shopkick makes it so easy to earn points just for walking into the store! Scan products and your receipt to earn even more. Sign up with Shopkick for an easy way to earn Amazon gift cards. My Points is a great way to earn Amazon Gift Cards by taking surveys and earning cash back from online shopping. Take surveys to earn Amazon Gift cards. Earn Amazon Gift cards with Prize Rebel, similar to the way you use Swagbucks! Watch videos, surf the internet, take surveys, and online shopping. Sign up for Prize Rebel and start earning Amazon gift cards! How do you plan on earning extra cash? !